Slaughterhouse-Five is not only Vonnegut's most powerful book, it is also as important as any written since 1945. Like Catch- 22, it fashions the author's experiences in the Second World War into an eloquent and deeply funny plea against butchery in the service of authority.Slaughterhouse-Five boasts the same imagination, humanity, and gleeful appreciation of the absurd found in Vonnegut's other works, but the book's basis in rock-hard, tragic fact gives it a unique poignancy - and humor. Slaughterhouse Five, since it was written, has always been subject to controversy and censorship due to its language, sexual and irreligious themes, use of outdated but nevertheless offensive terms, and for its portrayal of US soldiers in WWII. Over the years it has been a regular presence on the Banned Books list and will probably continue to be so. Okay, so a couple of months ago I came across a pretty famous Dean/Castiel fanfiction. In it, Dean is a late night radio show presenter who talks about a variety of subjects, mostly music but sometimes books. And one of his favourite authors is Kurt Vonnegut. He talks about two of his books specifically – Cat’s Cradle and Slaughterhouse Five. The way the author of the fic wrote about these books really got me interested, even more so because Vonnegut’s been referenced on Supernatural a few times. The moral of the story here is that I can basically find book recommendations just about anywhere. I’ve never actually read anything quite like Slaughterhouse Five; it’s pretty much a unique book in as far as it’s written, I think. The novel gives you two points of view but only one narrator – our main character, Billy Pilgrim, is a fictional character who was a soldier in WWII and found himself captured as a POW by the Germans. As well as thousands of other POWs, Billy is taken to Dresden for the duration of his capture and is present during the Dresden air raids which decimated the city. Dresden is remembered as one of the great controversies of WWII – like Hiroshima and Nagasaki, discussions have gone back and forth over the years on whether the actions of the Allied forces were justified. This is a big part of the novel, and the author comes back to it again and again, at one point poignantly pointing out that it took an atomic bomb to wipe out Hiroshima but only the most basic weaponry to decimate the city of Dresden. The second point of view comes from the narrator, and this is what I found so interesting about the novel – the narrator is the author himself. 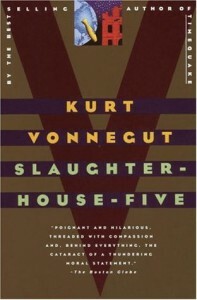 Vonnegut opens Slaughterhouse Five with an introductory chapter in which he explains how for so long he wished to write a book about Dresden, and closes the novel with a final chapter from his own point of view. He exists as a character throughout the novel, but is only a periphery one – for instance, Vonnegut is also captured as a POW and taken to Dresden, but his presence there is only given a sentence’s notice. I just really loved that because it so brilliantly brings together fact and fiction while also giving precedence to the story and not the author. There is a very powerful anti-war sentiment in this novel and it’s clear from the alternate title that Vonnegut gives to the book in the introductory chapter – he names it ‘The Children’s Crusade’ as a poignant reminder that many of the soldiers who went to war and never came home were boys just out of school, inexperienced and naive. Billy Pilgrim reads like a character going through severe depression, and the description of the fire-bombing of Dresden is honestly horrific. What I find incredibly powerful about this novel though is how Vonnegut gives us such a human insight into the POW camps – it isn’t romanticised and there aren’t any dramatic attempts at escape. Instead we’re introduced to English soldiers who hoard food and behave like every day is a party, Russian soldiers who are starving to death and American soldiers who have a reputation among their German guards as being notoriously unable to follow rules or respect their own brothers. I do think this book is exceptional and definitely think that everyone should read it. 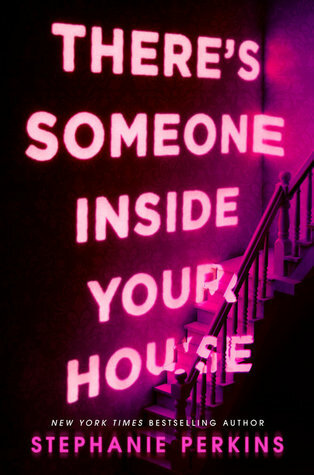 This is one of my favourite books. I love it for it’s fatalism and thoughts on free will, ‘so it goes’ it’s bliss just thinking about it. Naively perhaps, I never knew it was a banned book.